Jeff Bridges was 32 when he appeared in his first Disney film. It took him 28 years to do it again. 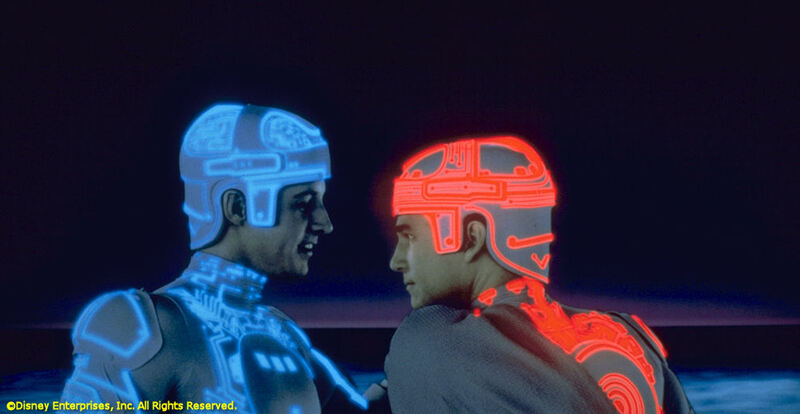 Bridges played video game geek Kevin Flynn and his digital doppelganger Clu in both Tron (1982) and Tron: Legacy (2010). For two movies where actors took the backseat to whiz-bang special effects, Bridges still managed to stand out, a credit to his gifts as an actor. Throughout his career, he's had a knack for making mediocre movies good and good movies great (see The Big Lebowski, Tucker: The Man and His Dream, and the criminally overlooked The Door in the Floor). Neither Tron nor Tron: Legacy are great films, but they are entertaining eye candy and that's OK. That's all they were intended to be. Tron tested the limits of early computer animation and is the more groundbreaking film. Tron: Legacy, however, is the better overall movie experience, with bigger and bolder visual effects. Twenty-eight years of improved digital technology were kind to it. As far as Bridges performances, I prefer him as the cocky, goofy computer nerd of the first movie compared to the grizzled zen master he played in the second ("180 degrees from where we left him," commented Bridges). His nervous energy as he bounds up the stairs of the research lab or explains his plan to recover stolen game programs are what propel the scenes that are otherwise "off the Grid." He proves the perfect foil for bad guy David Warner, who does triple duty as the weaselly corporate drone Dillinger, his merciless program Sark, and the all-powerful Master Control Program (I'm pretty sure Warner played the villain in every movie produced in the 1980s--and then he sunk the Titanic). In Tron: Legacy, using motion capture animation and facial mapping, Bridges played Clu as a younger version of himself. The effect is creepy, but it works. And it's still Bridges performance, even if it is digitally reproduced. Kevin Flynn's ultimate fate in Tron: Legacy was up for grabs, leaving the door open for a new Tron installment (a script is already being worked on). Disney already put "day after" teaser videos on the Blu-ray release of Tron: Legacy, which were also briefly leaked online. Apparently, there is much speculation that "Flynn Lives." Will Jeff Bridges be back for a third go-round on the Grid? I expect he will, and he'll again be as much fun to watch as the digital bells and whistles on screen.